Virtual reality and augmented reality are hot topics right now. As we start to see the lines blur between real and virtual worlds, the possibilities become endless. But what will we see next? How big of a role will it play in our lives in the next 50 years? 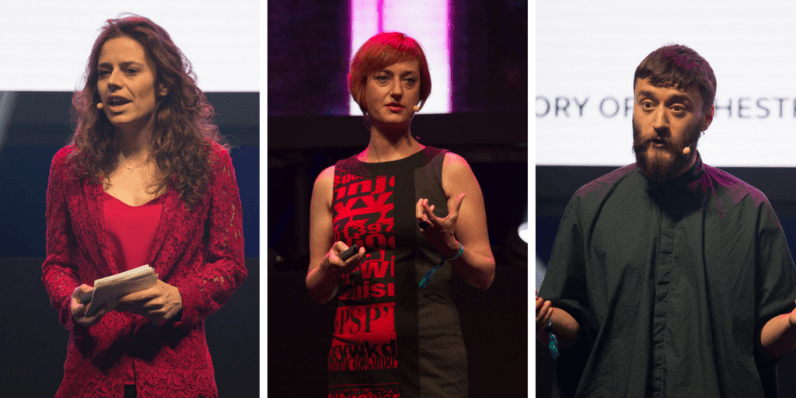 At the Mixed Realities track at TNW Conference last month, we saw VR and AR experts share their visions for the future. Want a recap? We’ve got you covered. Alex spoke about his experiences with AR so far, and how we’re going to be pushing the limits in the future. He began with a brief discussion of the new marketing opportunities made possible with the tech. His past projects involved using the Snapchat AR functionalities to market Nike Jordan trainers. By creating a 3D rendering of Michael Jordan jumping into the air right before a slam dunk, people could interact around him. The interesting feature was that it linked directly to Nike’s online webstore, where people could purchase the shoes. The problem with AR right now is that it’s individual and not persistent. We need the AR cloud — ‘The Mesh’ — to create a constant AR world where we can interact with all together, at the same time. Traditionally, you’re able to focus the viewer’s attention with a fixed frame, but you can’t do that with VR. The viewer is free to explore, and so you must guide the viewer’s attention — it requires a wise position of a point of interest. In VR, the user becomes the protagonist of the story. They are in the centre of the atmosphere, and this changes the whole dynamic. These are things she has learned along the way of creating VR films. The next foray, according to Alice, is the introduction of sound and smell into the experience. This creates an entirely new reinvention of how the user interacts, and of how the frame is changing. She concluded her talk by sharing her latest project: Soundtouch. It aims to be the first tactile VR video documentary, and it focuses on the sensation of touch. Vesna has focused her artwork on mixed realities, ranging from music to dance performances. Each piece is grounded in MR, which expands the audience interaction and experience. She speaks about her various performances on stage at TNW Conference, and shares her thoughts on how MR can continue to change the way we interact with artwork. Her more recent work focuses on monitoring the audience engagement — their gestures and voice — to alter the physical performance on stage. Ersin spoke about his work in a forest in England’s Lake District, titled In the Eyes of the Animal. It centers on seeing the forest through the eyes of different animals. The aim of using VR in this setting is to reinvigorate our connection with nature, and understand how animals see our world in a whole new light. His project also reinvents the look and feel of headsets, by making them as visually stunning as the experience itself.